HIPEC surgery, also known as heated or hyperthermic intraperitoneal chemotherapy, is the process of heating chemotherapy drugs and delivering them into the abdominal cavity. This treatment is often combined with cytoreductive surgery and is an effective approach for peritoneal mesothelioma. Dr. Charles Conway explains the HIPEC treatment for peritoneal mesothelioma patients. Cytoreduction and HIPEC surgery is a multimodal treatment plan that has significantly improved survival for peritoneal mesothelioma patients. The average survival was around six months before this therapy became available. Now half of patients who qualify for HIPEC surgery live longer than five years. A 2018 International Journal of Hyperthermia study looked at the outcomes for 76 peritoneal mesothelioma patients treated with HIPEC surgery. Median disease-free survival was almost five years, and median overall survival was more than eight years. Doctors developed the HIPEC procedure to improve the relatively poor results of traditional chemotherapy treatment. Although many patients respond well to unheated chemotherapy drugs, the effects are often short-lived. Although the specific approach to HIPEC surgery can vary depending on the doctor and treatment center, the general concept is always the same. The procedure has two phases: Cytoreductive surgery followed by heated chemotherapy. First, doctors perform cytoreductive surgery to remove as much tumor growth as possible from the abdominal cavity. HIPEC without surgery is ineffective because the chemo drugs cannot penetrate deep into cancerous tumors. In some cases, complete removal of the tumors is impossible and patients may need to explore other treatment options. Mesothelioma doctors any remaining cancer cells with heated chemotherapy immediately after surgery to extend survival and prevent cancer recurrence. The usual chemotherapy drugs, including carboplatin, cisplatin, doxorubicin, gemcitabine and pemetrexed, have all been used for heated chemotherapy. Instead of injecting these drugs into your blood, doctors deliver them directly to the chest or abdomen. 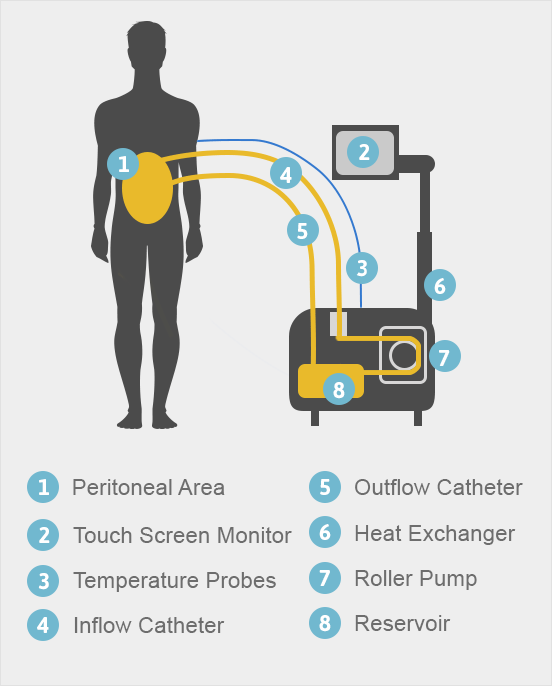 Doctors insert catheters into the abdominal cavity and connect them to the perfusion system, which heats the chemotherapy solution and pumps it to and from the body. As the solution flows through the machine, a heating element raises it to between 105 and 109 F. Cancer cells start to die when heated to around 104 F, while normal cells can survive up to 111 F.
A doctor massages the abdomen by hand to ensure the solution is fully mixed. This step helps the drugs reach remaining cancer cells. The chemotherapy drugs flow between the patient and perfusion system for about one hour. When the chemotherapy bath is finished, doctors drain the medicated solution from the body. The cavity is later rinsed with only a saline solution before the catheter is removed and incision is closed. The entire procedure, including surgery and HIPEC, may take between six and 18 hours to complete because surgery times vary. The more the cancer has spread within the abdomen, the longer surgery will take. After HIPEC surgery, you should expect a recovery time of several months. Your treatment team will go over everything you need to know about the recovery process, including how to care for your incision wounds and encourage healing. The most challenging aspect of recovery is fatigue. It will likely take two to three months until you begin to feel back to normal. Until then, it is important to stay active (within your limits) and maintain good nutrition. Eating right and balancing your diet while undergoing peritoneal mesothelioma treatment can help ease your symptoms. Which Patients Are Eligible for HIPEC Treatment? As with any aggressive treatment, not all patients are eligible for HIPEC treatment. Doctors look for patients who are otherwise healthy except for their cancer diagnosis. They conduct assessments to determine a patient’s overall health, which they call performance status. Connect with a top mesothelioma doctor who has the knowledge and experience treating this rare disease. The main reason this procedure is not offered as a standard treatment option at all mesothelioma cancer centers is because of the complexity of cytoreductive surgery and lack of familiarity with the HIPEC procedure and equipment. Numerous studies show HIPEC surgery drastically improves life expectancy in about half of the peritoneal mesothelioma patients who undergo the procedure. In 2018, Dr. Paul Sugarbaker, who helped pioneer HIPEC surgery, published an update on the best treatment approaches for peritoneal mesothelioma. His report included survival results from a study he authored in 2017. Sugarbaker’s study used cytoreductive surgery and HIPEC to treat peritoneal mesothelioma, with some patients also receiving one or two additional types of chemotherapy. Some patients received early postoperative intraperitoneal chemotherapy, commonly called EPIC. Other patients received EPIC plus adjuvant normothermic intraperitoneal chemotherapy, also called NIPEC, which is used long-term to prevent recurrence. Sugarbaker’s results indicate that long-term, nonheated intraperitoneal chemotherapy is an effective maintenance therapy that improves peritoneal mesothelioma survival. In 2015, researchers from the Washington Cancer Institute’s Program in Peritoneal Surface Malignancy published results from a study on the survival outcomes of using HIPEC surgery a second time to treat recurrence. Survival after a second HIPEC surgery was 4.5 years compared to 6.4 years after the first HIPEC surgery. These results suggest the HIPEC procedure is an effective second-line therapy for recurrent peritoneal mesothelioma. In 2009, one of the largest multicenter studies on HIPEC for peritoneal mesothelioma patients published its findings. Dr. Tristan Yan and colleagues confirmed the treatment can significantly extend survival for select patients. After follow-up with more than 400 patients, the researchers reported an overall median survival of 53 months — nearly 4.5 years. One patient survived for more than 19 years after the procedure. Survival rates of one, three and five years were 81 percent, 60 percent and 47 percent, respectively. For the right patients, HIPEC surgery can extend survival and provide a better quality of life. However, the medical community has yet to reach an agreement on the best drug combination, chemotherapy temperature and exposure time for mesothelioma patients. As researchers uncover more about the technique, it is likely that survival outcomes will continue to improve. Sugarbaker, P.H. (2018). Update on the management of malignant peritoneal mesothelioma. Kalff, J.C. et al. (2017, July 17). Postoperative ileus. Kim, J., Bhagwandin, S. & Labow, D.M. (2017). Malignant peritoneal mesothelioma: A review. Sugarbaker, P.H. & Chang, D. (2017). Long-term regional chemotherapy for patients with epithelial malignant peritoneal mesothelioma results in improved survival. Goodman, M.D. et al. (2016). Chemotherapy for intraperitoneal use: a review of hyperthermic intraperitoneal chemotherapy and early post-operative intraperitoneal chemotherapy. Ihemelandu, C., Bijelic, L., & Sugarbaker, P.H. (2015). Iterative cytoreductive surgery and hyperthermic intraperitoneal chemotherapy for recurrent or progressive diffuse malignant peritoneal mesothelioma: clinicopathologic characteristics and survival outcome. Tannapfel, A. (Ed.). (2011). Malignant Mesothelioma. New York, NY: Springer.